It is inevitable while traveling in the California desert, Sierras and Pacific coast range, that you will come across a rattlesnake. I live in rattlesnake country and it is still unnerving to have a close encounter. Rattlers tend to mind their own business and are an important part of rodent control. It is good to educate yourself as to where they like to hangout and simply make yourself a rule to never put your hands where you cannot see and to wear protective boots when hiking in their domain. digesting a ground squirrel. Rattlesnakes come in many different colors varying from a very dark green (dubbed Mojave Green) to different shades of brown and tan. They have natural camouflage and blend in well with their surroundings which is why it is easy to accidentally come close. As long as you give them a wide berth they are usually content to watch or quietly slither away. 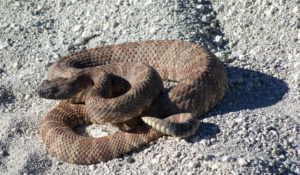 Rattlers can swim and climb trees or rafters in old buildings as well as rocky cliff walls while hunting for rodents. We were amazed to watch a rattler appear directly out of a crack in a sheer cliff overlooking the South Rim of the Grand Canyon. They especially like the cool temperatures found in the openings to old mines. When disturbing old wood or tin by a potential campsite, be aware a snake may be residing there. Sidewinders have been seen in the sand dunes of Death Valley and have amazing speed. I have found the young, smaller snakes to be more aggressive whereas the big ones are wiser and usually just want to keep their distance. 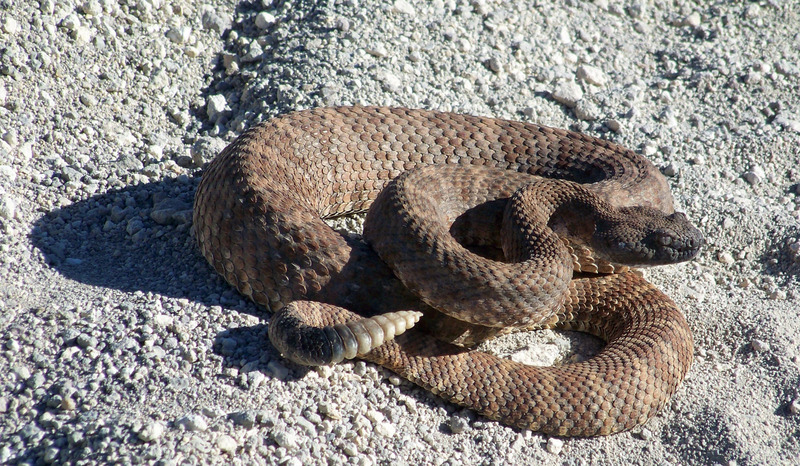 Be especially alert when rattlesnakes are most active in the Spring after hibernation and during mating season. or day, and tend to be more active at night. Many species of rattlers go into brumation, which is dormancy similar to hibernation during the cold winter months, making them less likely to come upon when it is cold. You might accidentally uncover one in a deep sleep in a pile of wood but they usually go underground using an animals den or creating a nest where they give birth to their young. Rattlers hear by using their jawbones while resting their jaws on the ground to pick up vibrations made by animals or people passing by. The jawbone can unhinge to swallow prey. 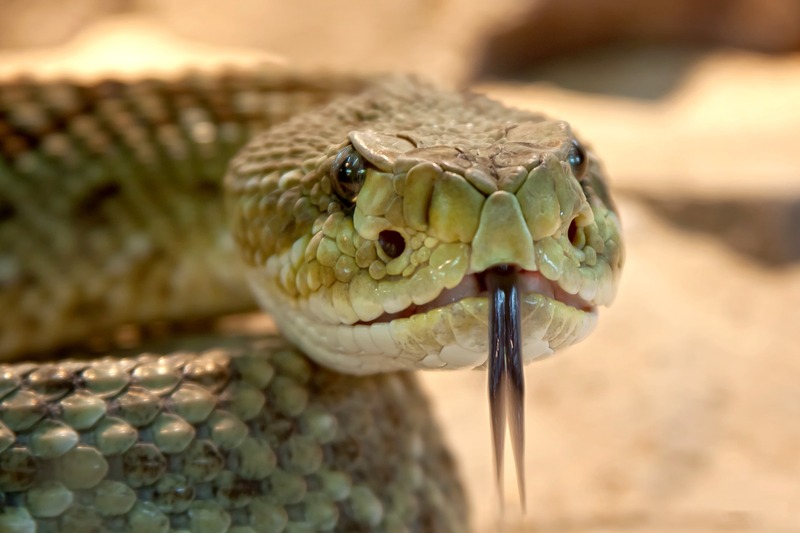 Rattlers have no eyelids and can only see up to 15 feet away. The tongue is used to smell. I encountered being “sniffed” by a flicking tongue while weeding a thick patch of rosemary. Thankfully this small movement alerted me to its presence and I decided the weeds could stay. A rattlesnake keeps growing during its entire lifetime. As it grows it must shed its outer layer of skin. Every time the snake sheds its skin, a new section is added to its rattle. My grandmother used to keep an apothecary jar filled with the rattles from snakes that had been killed at her ranch house. Some of the rattles were quite long and large and fascinated me as a kid. If you do happen upon a rattlesnake, freeze in your tracks. Be sure there are not more snakes in your path of retreat. Then without turning your back, move away very slowly without making any sudden moves. Never make a rattlesnake feel trapped or defensive. In general a rattlesnake can strike out for half of its body length. However, if it is perched up on a ledge it may be able to strike farther. In the wild there is no reason to kill a rattlesnake in its home territory as he is doing his part in nature’s scheme of life. However, if one decides to move in by your front door at home or your garden where little ones play, then measures must be taken. Never touch a dead snake as it can still bite due to reflexes. I have seen a snake continue to bite and wriggle long after being killed. Protect your dogs if you take them camping and hiking with you in snake country. Dogs can be vaccinated for snake bites, but most likely will still require a visit to your vet (few and far between in the back country!). You can do “snake smart” training by asking your local veterinarian for a class in your area. 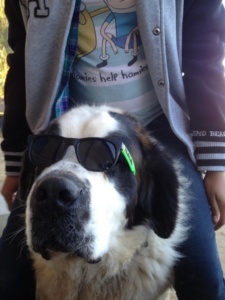 Here is an article for dog owners to check out. Personally, our 2 Saint Bernards are not good camping companions due to the extra space they require and the drool factor. However, they love to go for truck rides at home. I have skinned and cooked rattlesnake at home and yes, it does taste most like chicken. However, eating around all of the bones feels more like eating fish. I recommend barbecuing the meat after skinning the snake. My favorite source for rattlesnake information is Zoobooks. I used this full color magazine to teach our kids and grandchildren how to stay safe at our country home. This great guide prepares children for an encounter and inspires respect for a creature sometimes misunderstood. 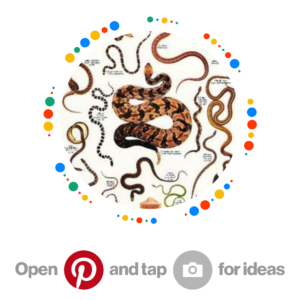 Check out my Pinterest “wildlife board” for more info on snakes.